Athey Kangal (The Same Eyes) is loads of fun. My DVD has this fabulous teaser leading up to the menu. How could you resist? 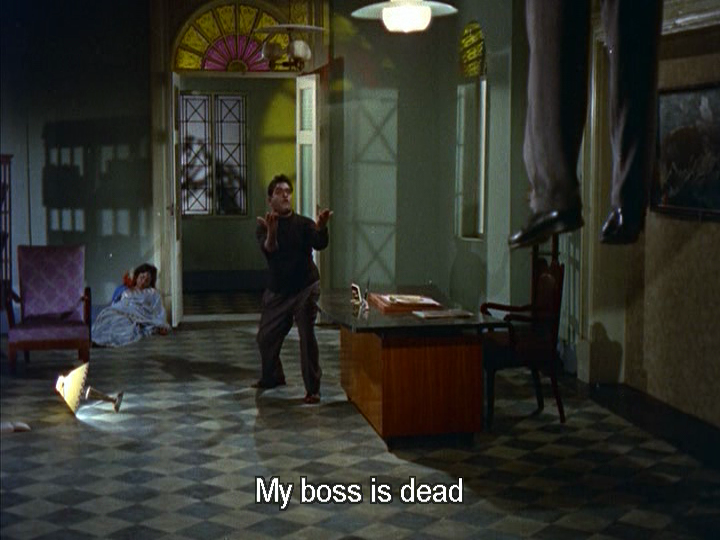 After a funky track over animated titles, the story kicks off with a bang. A spin on the country house murder mystery, AC Tirulokchandar opens with a murder staged to look like a suicide, a further murder attempt and a complement of suspects on the spot. A voiceover in the film asks that viewers refrain from spoiling the film for others so I will do my best to comply. The suspects include landlords Kamalanathan (S.A Ashokan), Vimalanathan (Ceylon Manohar), a visiting doctor friend (K Balaji), Nair the cook, and their resident physician. 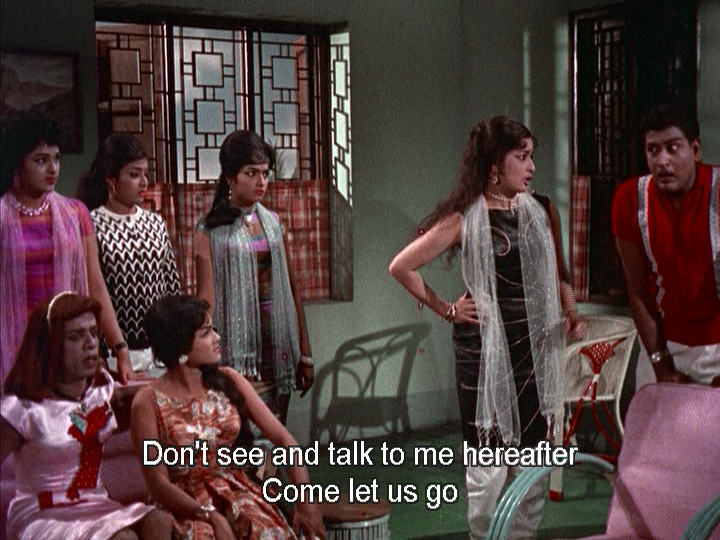 Things are further complicated when their niece Suseela comes home from college for a holiday, bringing a gaggle of girlfriends. Who will be next? And whodunit? Don’t get too caught up in the murder mystery. The characters only give it occasional attention and they are easily distracted from the sense of impending doom. Despite the death toll, the tone is generally light and the romance between Bhaskar (Ravichandran) and Suseela (Kanchana) takes the centre stage. They meet, they like what they see and love blooms. 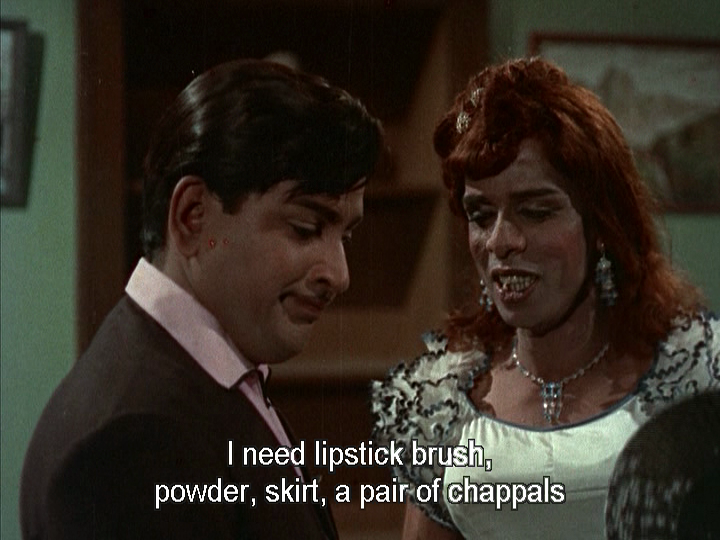 Bhaskar is a jolly and uncomplicated hero except for pretending to be married (to Nagesh in drag) so he could rent a room reserved for married couples. He is working as a musician at the Hotel Emerald and seems happy with his life and prospects. Suseela is equally straightforward. When she found out her true love was already ‘married’, she severed communication with him. But when he stalked her and produced both his wife and the explanation, she forgave him and enjoyed the absurdity of the situation as much as I did. There are abundant clues and red herrings. A cigar stub is found near all the victims, a mysterious lady in white flits around, Kamalanathan goes on ‘out of station’ journeys and just how many pairs of two tone wing tip shoes can there be? The aunty who survived a strangling attempt is unhinged and in danger. Following her near-strangling she also develops a fear of knives, loud noises and tomato sauce. Suseela starts to receive death threats over the phone and Bhaskar finds himself drawn into the hunt for the killer. This is good as the police have a sporadic and not very productive involvement in the case. Everyone seems to have been told to maintain an ominous expression with the intent to keep them all as viable suspects. Suseela puts on a brave face and surrounds herself with her friends but the threats escalate and so does her fear. The girls stay with Suseela and while they have very little dialogues, they do have excellent outfits and accessories which give them some individuality. I was tickled by their idea of suitable attire for social work in a village. Susi’s friend Julie is another bright spark although why why why would you look upon Nagesh and find insta-love? 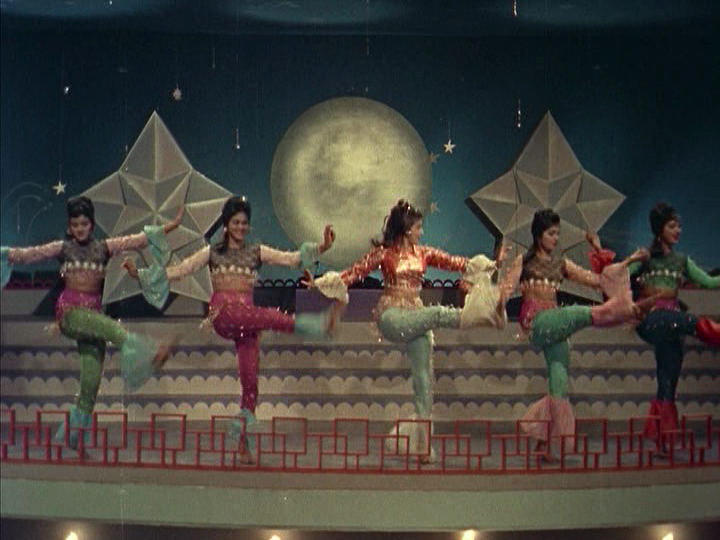 The costume team reserved their best efforts for the ladies, and maybe Nagesh. I cannot think of a good reason for his pale pink satin dress with red velvet dragon applique but I am pleased they came up with it. AC Tirulokchandar has opted for a broad, slightly over the top, style from his actors. Ravichandran looks like he is having a fine time in most of his scenes and gives the dancing a decent try. While there should be a question mark over this plausible stranger he is just too nice to be the real killer. 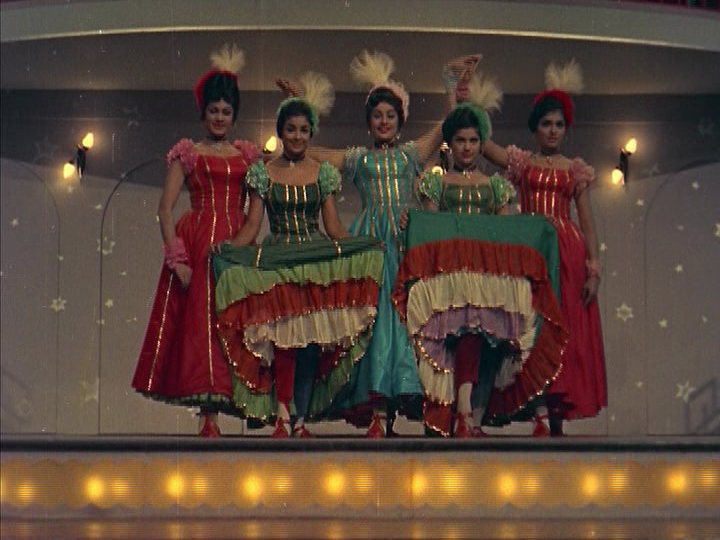 Kanchana is bubbly and a good match for Ravichandran, although thankfully her dancing is better. I did wonder at Suseela’s ability to seemingly forget that her life was in danger but maybe it takes more than a gunman mortally wounding her birthday cake to rattle Susi. It was nice to see a heroine who isn’t a total panic merchant. 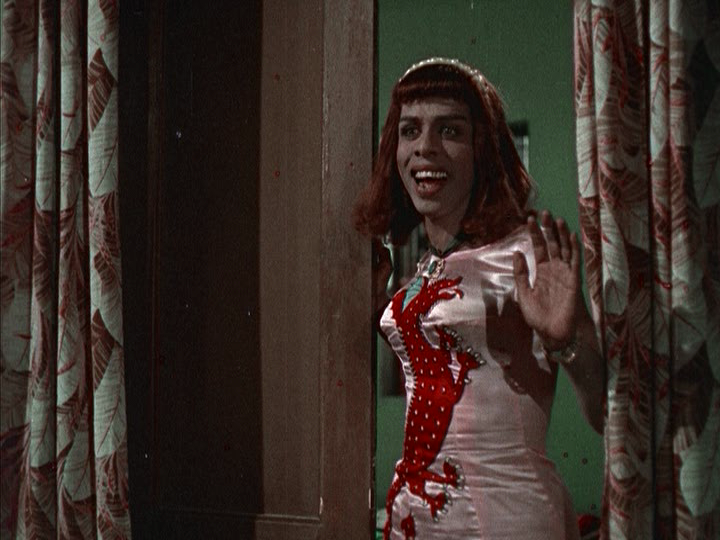 Nagesh is reminiscent of Jerry Lewis, and that stops me from liking him wholeheartedly. To be fair, he does enliven some scenes very nicely especially the dances or musical breaks. Veda’s music is wonderful. Borrowing heavily from the James Bond theme at times, the tone is jazzy big band and brassy. The songs are beautifully filmed and have an exuberant and cheeky humour. 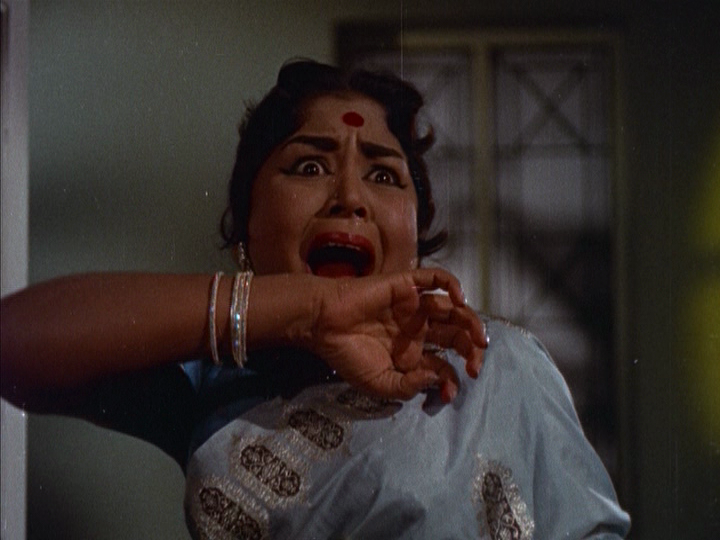 There is a wonderful scene where Suseela and the girls are scared at home alone. As a way of whistling in the dark they put on a record and the dramatic percussion is a very funny counterpoint to their increasingly fearful faces. The visual design is a delight from start to finish. The main mansion set is crammed with sculptures and taxidermy, just the thing to create startling shadows and get the nerves jangling. The interior designer loved feature walls with elaborate mouldings. There is excellent use of windows and niches framing shots, giving a sense of people lurking. I like the way the windows in the aunt’s room look like eyes gazing down at her. No wonder she was a basket case. I like the relationship between Bhaskar and Suseela as they seem to have similarities in their approach to life and are equally committed to song interludes wherever possible. The comedy is painful at times and I just don’t think fat or wearing a dress is an automatic joke. But the hijinks are in keeping with the rest of the tone so while I could wish away the comedy uncles they aren’t a total disruption to the narrative. The supporting actors, and iMDB is useless for naming them, are mostly fine. 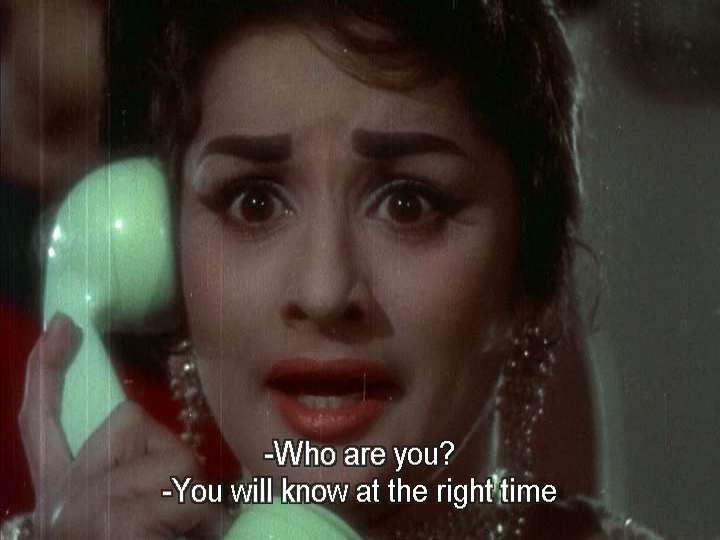 There are a few vague similarities to Teesri Manzil in the Bhaskar and Suseela romance and the murder mystery, but the story is different in some details and the level of angst is considerably lower. Often with older films I find myself taking lots of notes or making diagrams and charts to keep track of who’s who. 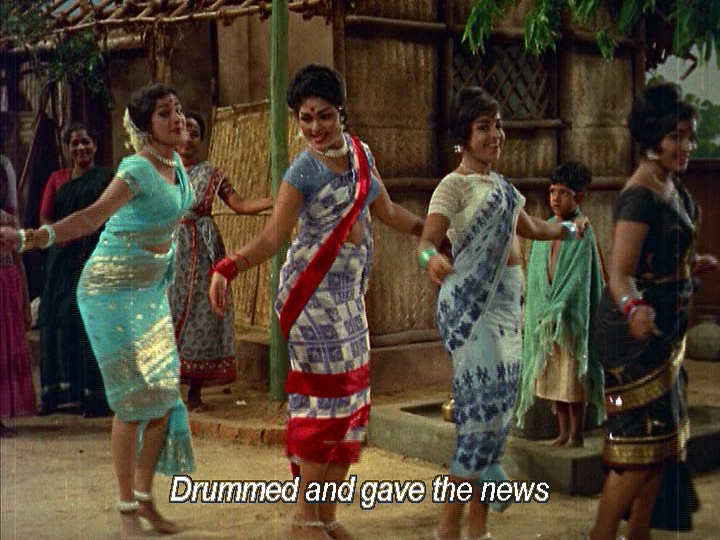 I just sat back and enjoyed Athey Kangal immensely. 4 stars! This entry was posted in Kollywood and tagged AC Tirulokchandar, Athey Kangal, Ceylon Manohar, K.Balaji, Kanchana, Kollywood, Nagesh, Ravichandran, S.A Ashokan, Tamil, Veda. Bookmark the permalink. This is in Telugu with Krishna as “Ave kallu”. I love this! We laughed and laughed at 60s fashions on men and women, and dance! I thought the Telugu one was original and Krishna was the mastermind behind introducing bond-type movies to the South. I don’t know how Ravichandran fared in Tamil, but Krishna was truly hilarious. He has proper detective stance, but can’t dance for the life of him. And he is a drummer in hotel and swing dances, oh Lord! The song where hero and his friend plays a prank on the heroine and friends on her birthday is my favourite. I think in those days, the studios made same movie in Telugu/Tamil with different leads at the same time. So, costumes, sets, and junior artists are all the same. 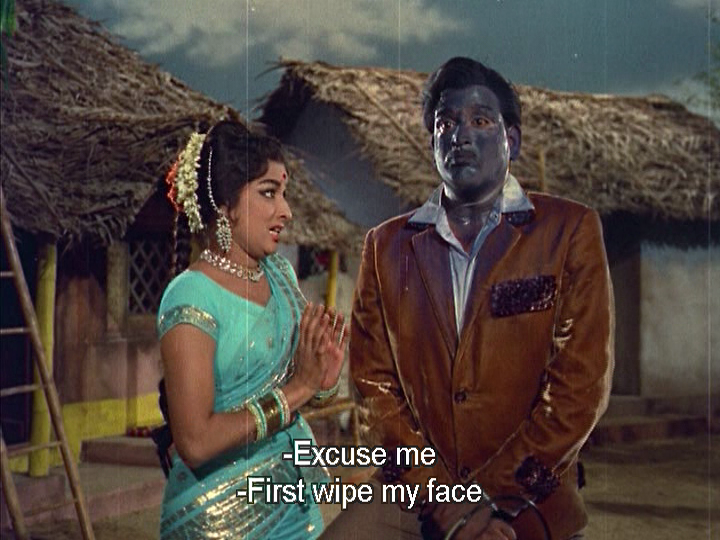 Even, both movies have Kanchana. I imagine Kanchana had twice the work doing the same scenes with Krishna and Ravichandran. 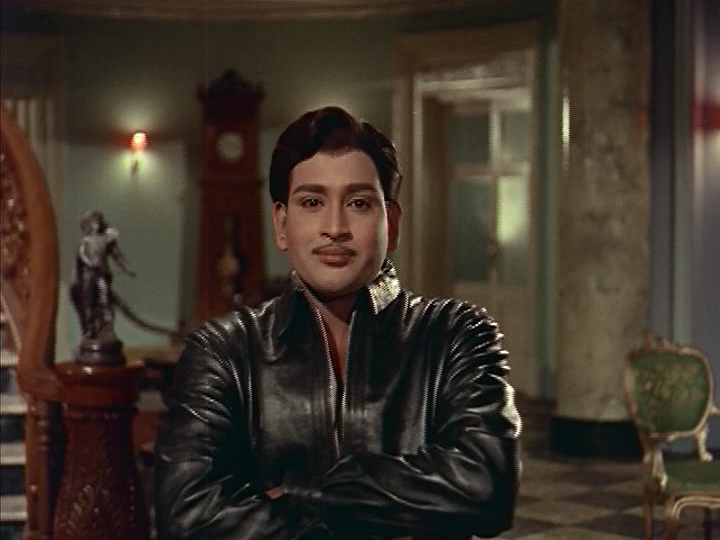 Well the Tamil movie ‘Adhe Kangal’ is the original since wikipedia says that the Telugu version was simultaneously remade and Krishna was not the one to introduce Bond type movies in South India. There was Jaishankar who also acted in the same period and did a few Bond type movies and was referred to as ‘Thennagathu James Bond (South Indian James Bond)’. 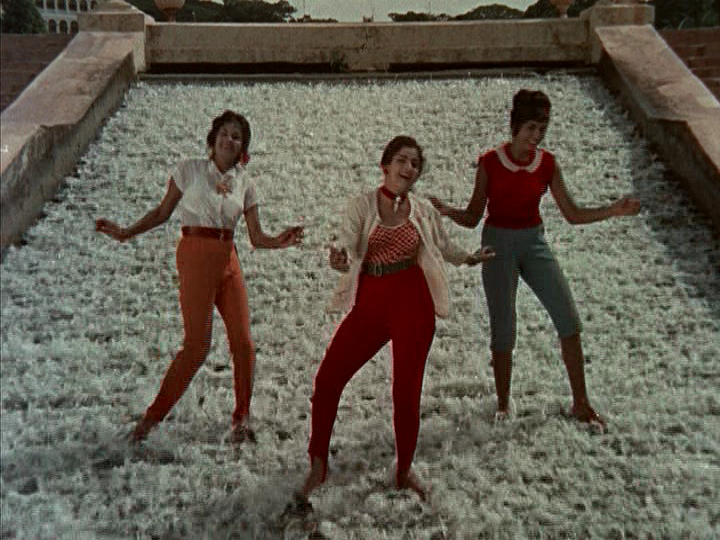 It seems the Tamil version was released during May 1967 and the Telugu version during December of the same year. In the latter part of the film, the hero phones up to the heroine; but she does not lift if faring that it is from the serial killer. Then, she and her friends play a gramaphone record on the record player. Can any one give the name of the instrumental song played there for my information. Similarly, Nagesh also plays another instrumental bit in his room when his would be love calls him thinking that he is a woman. The name of this song also may be given for my information.